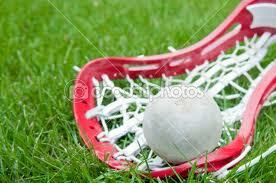 Depending on level, a girls’ lacrosse game is usually 40 or 50 minutes, divided into halves. Time-outs can be called after a goal is scored; each team is allowed two time-outs per game. Girls’ and women’s lacrosse begins with a draw, which is taken by the center position. 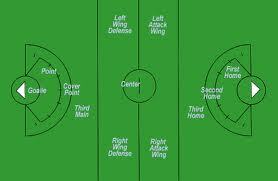 The ball is placed between (2) horizontally held crosses (sticks), placed back-to-back, at the center of the field. At the sound of the whistle, the ball is flung into the air as the crosses are pulled up and away. The sticks must come up over the players’ head. A draw is used to start each half and after each goal, and it takes place at the center of the field. Only (5) players from each team are permitted between restraining lines at the time of the draw. Once the signal for the draw occurs, the players behind each restraining line may cross over. When one team gains control of the ball, her team goes on offense. The offensive team can pass and run the ball down the field toward the opposing goal. Defensive players can gain possession of the ball by stealing it mid-pass or from a legal check to the opponent’s stick. A controlled check (crosse to crosse contact) is an attempt to knock the ball free. Rough checking or contact between a lacrosse stick and another player’s body are not allowed and can be called as fouls. However, incidental body contact may occur. No player may reach across an opponent’s body to check the handle of a crosse when she is even with or behind that opponent. A player may not protect the ball in her crosse by cradling so close to her body or face so as to make a legal, safe check impossible for the opponent. When the referee rules that a ball is out of bounds, the player closest to the ball gets possession, and the play resumes. When a whistle blows, all players must stop exactly where they are. In girls’ lacrosse, players cannot come within (7) inches of each others’ heads with sticks. Seven (7) attacking players only are allowed over the restraining line in the offensive end and only (8) defenders are allowed over the line in their defensive end. The additional defender is the goalkeeper. Players may exchange places during play, but the player should have both feet over the line before the teammate enters. The restraining line, a solid line (30) yards up field from each goal, extends across the width of the field. Solid/hard boundaries were added to the game in 2006. Total length can be from 110 to 140 yards, while total width can be from 60 to 70 yards. There must always be at least 10 yards of space between the goal line and the end line at each end of the field. There is a circle in the center of the field where the draw occurs. Two (2) arcs are marked from the center of the goal line. The eight meter arc with hash marks (4) meters away from each other bisect the arc. The 12-meter fan runs out from the goal line extended. Substitution area, used by both teams, is in front of the scorer’s table and is indicated by (2) hash marks placed (5) yards on either side of the midfield line. 1. A professionally manufactured and properly worn mouth guard which shall include an occlusal (protecting and separating the biting surfaces) and a labial (protecting the teeth and supporting structures) portion that covers the posterior teeth with adequate thickness. 3. 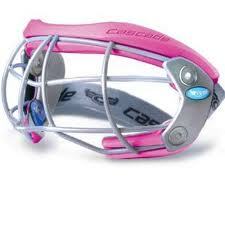 Eye protection or goggles meeting the ASTM certification for woman’s lacrosse (F803).